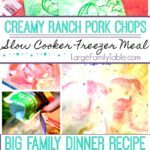 Enjoy this creamy batch of slow cooker ranch pork chops with your family! Goes well with corn, salad, and bread. You can combined all ingredients in something like this large mixing bowl, then divide evenly across 2 gallon freezer bags. You’ll have about 2.5 lbs of pork per gallon freezer bag.